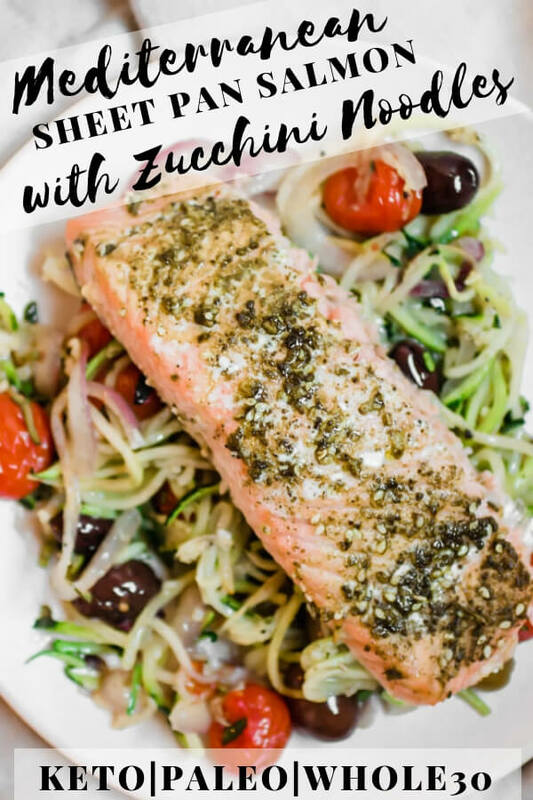 Mediterranean Sheet Pan Salmon with Zucchini Noodles, 15 minutes to a healthy delicious dinner! 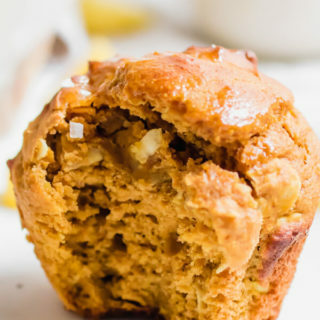 Paleo, Whole30, gluten-free, anti-inflammatory, good for you and delicious! 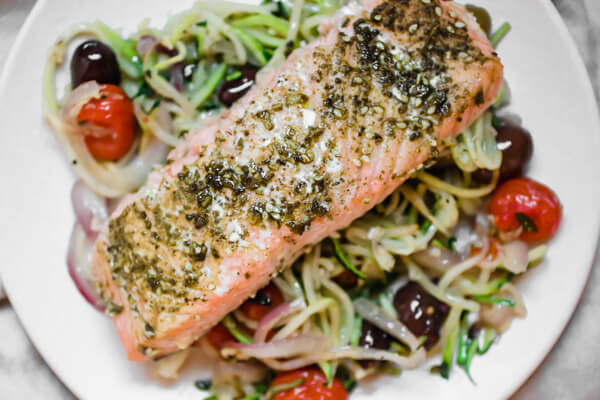 Mediterranean spiced salmon nestled on a bed of zucchini noodles, olives, tomato, onion, and garlic. A few simple ingredients, one sheet pan, and 10 minutes in the oven. 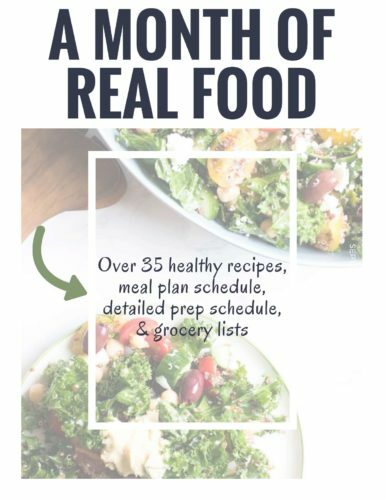 I’d like to introduce you to your new back pocket – go-to – quick and healthy – I need dinner and have exactly 15 minutes – recipe. 15 minutes from start to finish. I mean come on! 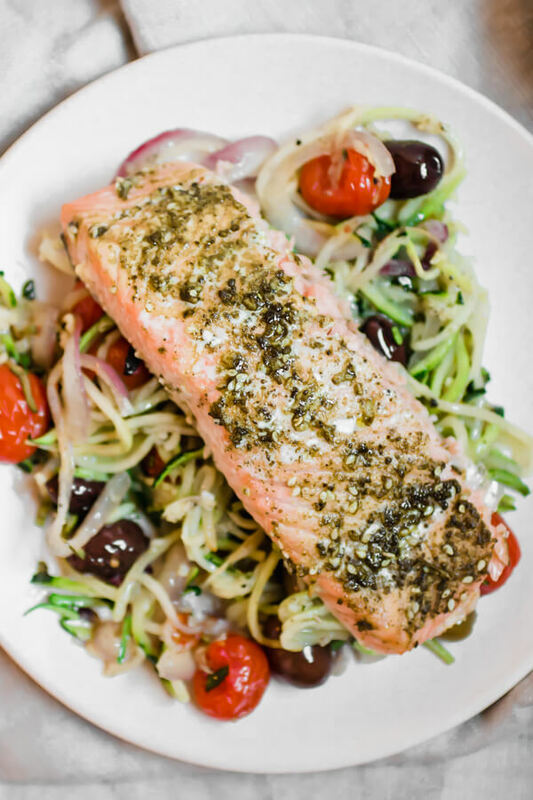 Briny olives, salmon coated in a crave-able garlic za’atar spice rub, zucchini noodles, the pop of fresh tomato, who could ask for anything more? I’m going to start off by telling you to go ahead and buy that pre-spiralized zucchini at the grocery store, it’s worth the extra money because it means dinner literally happens in 15 minutes! 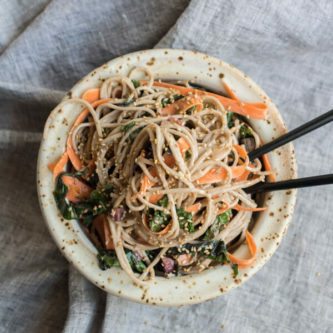 Or, if you are a meal prep maven go ahead and spiralize a few zucchinis at the beginning of the week (store them in a glass lock container with a paper towel on the bottom to absorb moisture), making dinner time uber easy. 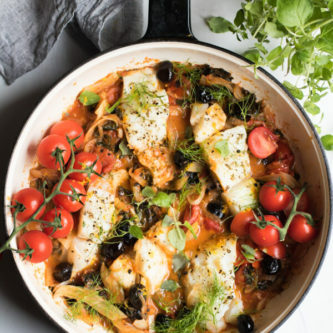 January is equal parts slow cooked warm and comforting one-pot meals (hibernate vibe) to quick and easy meal prep like a boss, bring on all the healthy food recipes (take over the world vibe). Do you know what I mean? 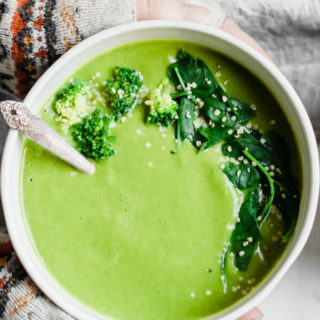 The perfect combination of warm soups, and sheet pan dinners, meal prep salads, and portable snacks. January is all the things. 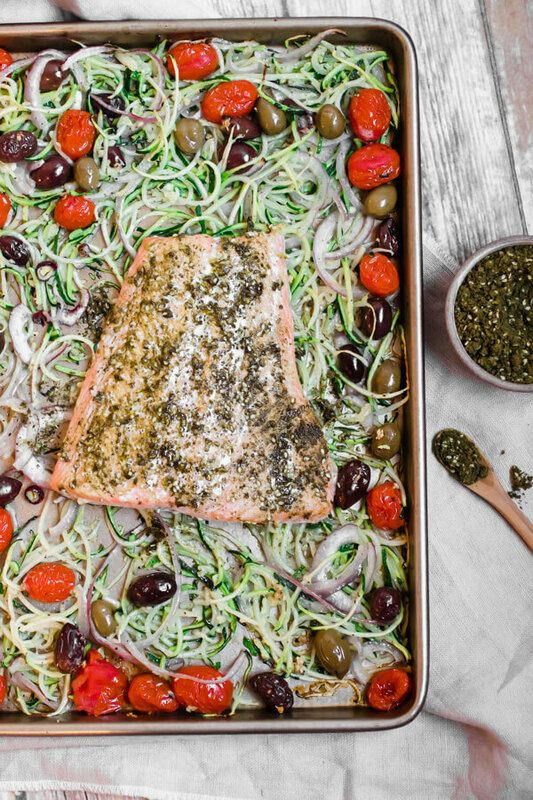 This sheet pan salmon with zucchini noodles is perfectly perfect at this moment. Start with one pound of wild salmon – Wild salmon is far superior to farmed salmon. Farmed salmon is one of the most contaminated foods in our food supply and has been found to contain toxic chemicals methylmercury and dioxins. Wild salmon is more expensive but well worth it. 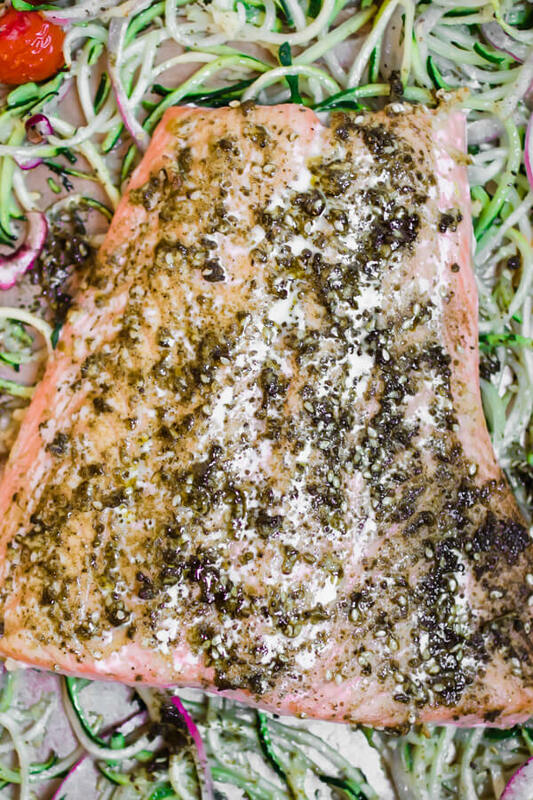 Make a spice rub for the salmon using Za’atar, crushed garlic, salt, and olive oil. Give that salmon a good massage rubbing all of those aromatic herbs and spices in. Toss your zucchini noodles with onion, crushed garlic, olives, tomato, and olive oil. You can do this directly on the sheet pan to avoid having to wash a bowl, or you can toss together in a bowl and then transfer to the baking sheet. 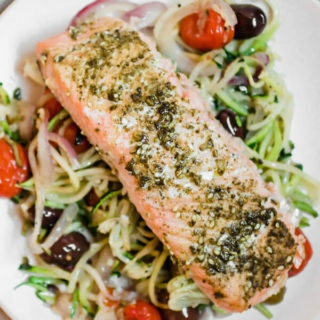 Arrange zucchini noodles around the salmon on a large baking sheet. Roast in a 400° oven for 10 minutes for medium salmon and 15 minutes for medium well. 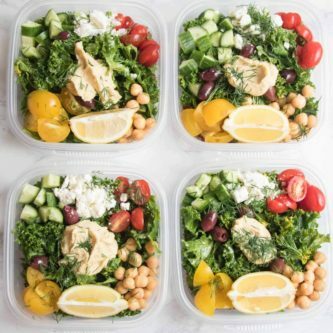 Enjoy right away or pack in individual containers for meal prep magic all week long. How long do I cook salmon at 400°? For Well-Done Salmon – Don’t do it. Seriously. If you cook it beyond medium well it will be dry and yucky. Za’atar is a middle eastern spice blend consisting of wild thyme, sumac, and sesame seeds. Traditionally za’atar was made from hyssop, which is an herb in the mint family tasting similar to thyme with a minty overtone. On my recent trip to Israel, I scored some traditionally prepared za’atar (made with hyssop) which is what I used in this recipe. You do not have to travel to Israel to purchase za’atar (although I would highly recommend it 😎). 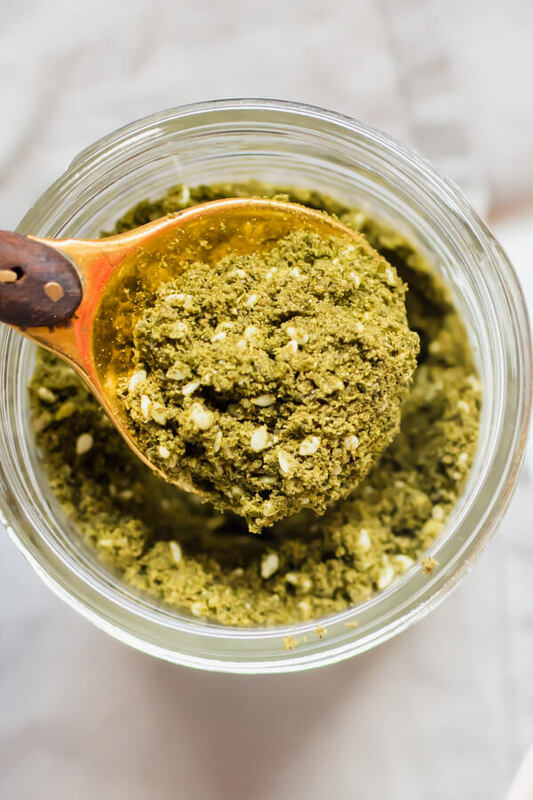 You can find a za’atar spice blend online or at a specialty grocery store, you can make your own za’atar using this recipe, or you can very simply substitute 1/4 tsp of dried thyme + 1/4 tsp dried oregano. Easy peasy lemon squeezy. 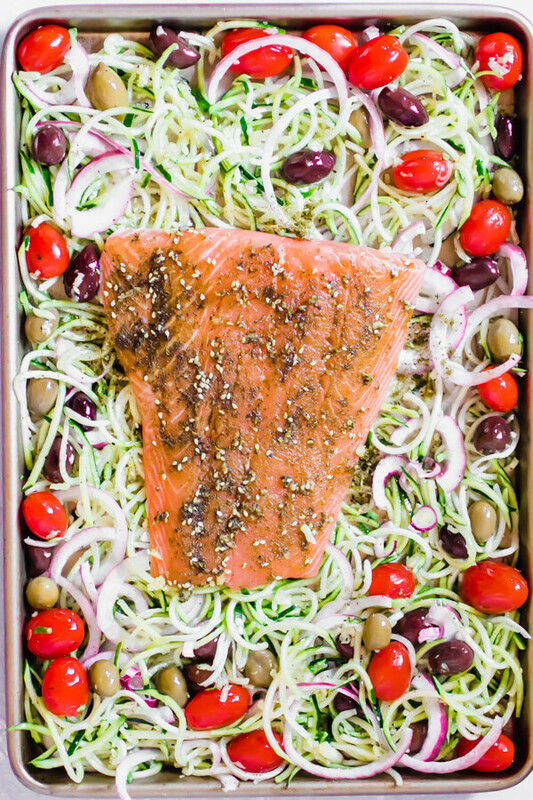 Mediterranean Sheet Pan Salmon with Zucchini Noodles, 10 minutes to a healthy delicious dinner! 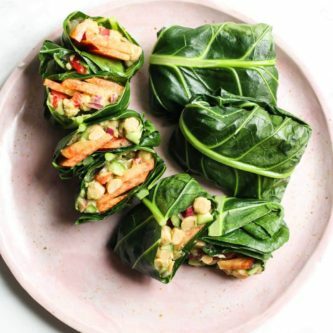 Paleo, Whole30, gluten-free, anti-inflammatory, good for you and delicious! Drizzle one teaspoon of olive oil on the salmon, coat with 1 clove of crushed garlic, za'atar spice (see note for substitution), and salt. Place in the center of a large baking sheet. In a medium bowl toss together zucchini noodles, 3 cloves of crushed garlic, tomato, olives, onion, black pepper, and olive oil. Pour onto the baking sheet and arrange in a single layer around the salmon. Roast in the oven for 10 minutes. (see notes for cooking time). Remove from oven, serve immediately with fresh lemon wedges and an extra sprinkle of flaky sea salt. Za'atar is a middle eastern spice blend that traditionally uses thyme, sumac, and sesame seeds. Although the one I use is from my trip to Israel and contains the ancient (biblical) spice Hyssop. You can find Za'atar blends in some specialty grocery stores, online, or make your own. Or... if all of that seems like too much trouble you can absolutely just use a pinch of dried thyme and a pinch of dried oregano, it's not the same (Za'atar purists please don't yell at me!) but it works perfectly well in this recipe. 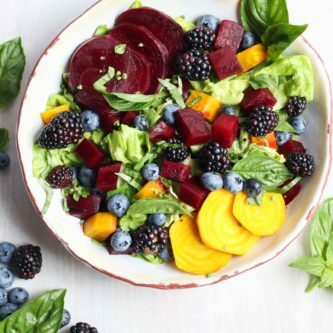 Pin to your Healthy Meal Prep Board! 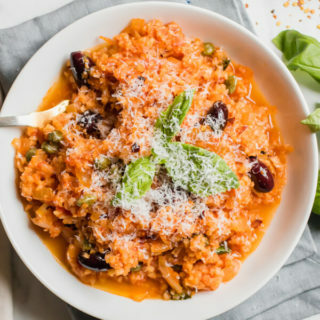 This is really easy and delicious. Makes in the time suggested however, the recipe instructions read 4 “heads” garlic and the ingredient list is 4 “cloves” garlic. It’s good with 4 cloves! 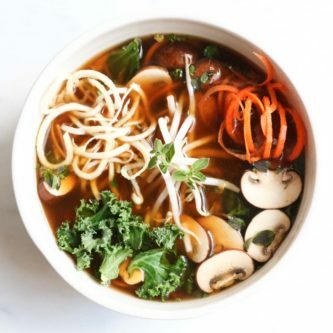 I’ve added it to our 2 week meal rotation. 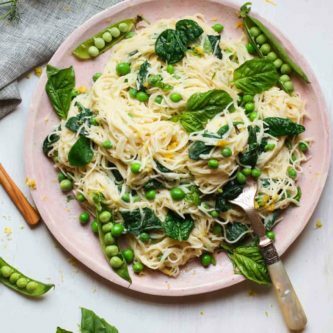 This recipe is also WW “Wellness Wins (formerly Weight Watchers) friendly with using 3 SP for 12 olives and 8 SP for the olive oil for a total of 11 points for the recipe and 3SP/serving. 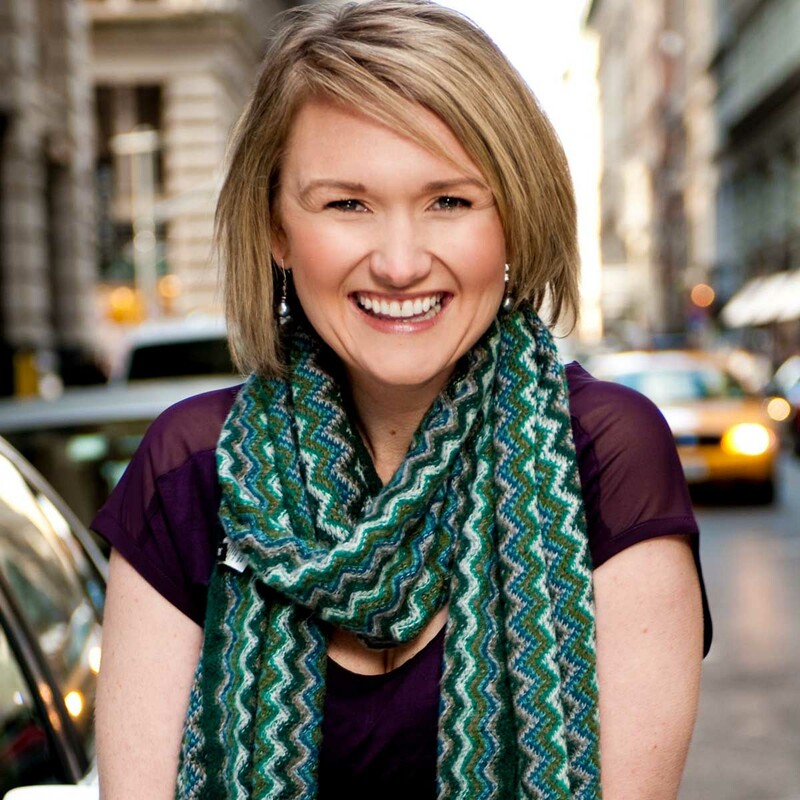 Hahah, thanks for the catch Melissa! I just updated the recipe, it is definitely cloves and not heads of garlic. Sometimes my obsessive love of garlic gets away from me 🙂 I’m so glad you enjoyed the recipe!